Zadar While there’s a lot of history in Zadar, I think you’ll really love how the old mixes with the new. Make sure to check out the Sea Organ and Sun Salutation. The sea organ is really a series of pipes that play music as the waves come in and hit them. Right next to it you’ll find the sun salutation, a big solar panel that collects sunlight during the day so it can display beautiful lights at night. Dubrovnik The entire city of Dubrovnik is a UNESCO World Heritage site. The best area to explore are the walls of Dubrovnik. You can walk them yourself or see them up high from a cable car. 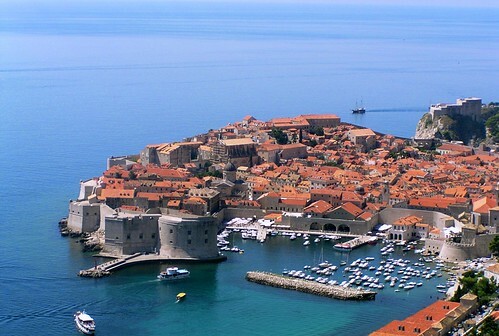 Dubrovnik was one of the filming locations for the current season of Game of Thrones. Pula Arena Located in a 3000 year old city, the Pula Arena dates to the 1st century and is one of just six major surviving Roman arenas in the world. It once held gladiators and now it’s a tourist attraction and public theatre space. Museum of Broken Relationships Located in the capital city of Zagreb, the Museum of Broken Relationships is based around “the concept of failed relationships and their ruins.” It might sound rough but it’s fun to see and encourages visitors to share their own failures in artistic form. Plitvice Lakes National Park The real beauty of the country, you can enjoy 6 interconnected lakes, caverns, caves, waterfalls, and trails at this national park. 1 million annual visitors can’t be wrong.